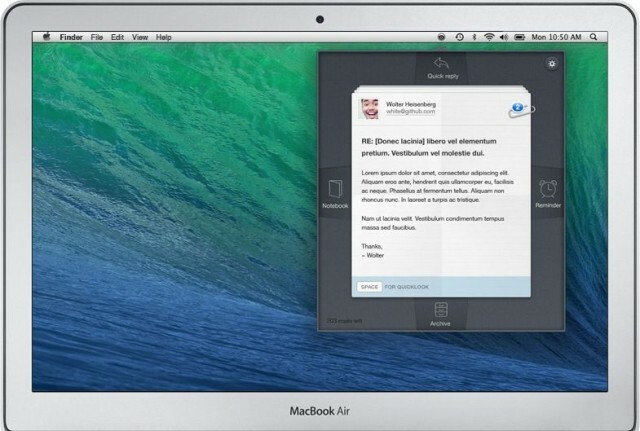 BlinkMail is a great new OS X mail app that lets you speed through your inbox using just the arrow keys. It also integrates with other services like Evernote, and Dropbox, Things and Omnifocus support is on the way. Navigation is done with the arrow keys, plus return, space and escape. You can assign different functions to the arrow keys, but the default is to flip up and won through the list, then use the arrows to archive, flag or file messages. Filing brings up a list of IMAP folders/Gmail labels and you navigate these using – you guessed it – the arrow keys. The app is in beta right now, and is missing a lot of features (the integrations with other apps and services for example) but it looks pretty good. It crashes when I try to set it up with my IMAP email, but my Gmail works fine. Sadly, all my Gmail is forwarded to my other address and immediately removed from my inbox, so I can’t carry out much testing. Still, it’s free and beta, so give it a whirl why dontcha?